In plants water is taken up from the soil through the roots, where it passes from the cortex into the vascular tissues. There are three routes for water to flow in these tissues, known as the apoplastic, symplastic and transcellular pathways. Specifically, aquaporins are found in the vacuolar membrane, in addition to the plasma membrane of plants; the transcellular pathway involves transport of water across the plasma and vacuolar membrane. When plant roots are exposed to mercuric chloride, which is known to inhibit aquaporins, the flow of water is greatly reduced while the flow of ions is not, supporting the view that there exists a mechanism for water transport independent of the transport of ions: aquaporins. In addition to the maintenance of normal cytosolic osmolarity, aquaporins can play a major role in extension growth by allowing an influx of water into expanding cells - a process necessary to sustain plant development. These five subfamilies have later been divided into smaller evolutionary subgroups based on their DNA sequence. PIPs cluster into two subgroups, PIP1 and PIP2, whilst TIPs cluster into 5 subgroups, TIP1, TIP2, TIP3, TIP4 and TIP5. Each subgroup is again split up into isoforms e.g. PIP1;1, PIP1;2. Within the various selection of aquaporin isoforms in plants, there are also unique patterns of cell- and tissue-specific expression. ↑ Agre P (2006). 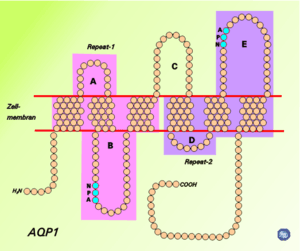 "The aquaporin water channels". Proc Am Thorac Soc. 3 (1): 5–13. doi:10.1513/pats.200510-109JH. PMC 2658677 . PMID 16493146. ↑ Agre P, Kozono D (2003). "Aquaporin water channels: molecular mechanisms for human diseases". FEBS Lett. 555 (1): 72–8. doi:10.1016/S0014-5793(03)01083-4. PMID 14630322. ↑ Schrier RW (2007). "Aquaporin-related disorders of water homeostasis". Drug News Perspect. 20 (7): 447–53. doi:10.1358/dnp.2007.20.7.1138161. PMID 17992267. ↑ Knepper MA, Nielsen S (2004). "Peter Agre, 2003 Nobel Prize winner in chemistry". J. Am. Soc. Nephrol. 15 (4): 1093–5. doi:10.1097/01.ASN.0000118814.47663.7D. PMID 15034115. 1 2 "The Nobel Prize in Chemistry 2003". Nobel Foundation. Retrieved 2008-01-23. ↑ Cooper, Geoffrey (2009). The Cell: A Molecular Approach. Washington, DC: ASM PRESS. p. 544. ISBN 9780878933006. 1 2 3 Gonen T, Walz T (2006). "The structure of aquaporins". Q. Rev. Biophys. 39 (4): 361–96. doi:10.1017/S0033583506004458. PMID 17156589. ↑ Kruse E, Uehlein N, Kaldenhoff R (2006). "The aquaporins". Genome Biol. 7 (2): 206. doi:10.1186/gb-2006-7-2-206. PMC 1431727 . PMID 16522221. ↑ Xu Y, et al. (2014). "A banana aquaporin gene". BMC Plant Biology. 14 (1): 59. doi:10.1186/1471-2229-14-59. PMID 24606771. ↑ Agre P, Preston GM, Smith BL, Jung JS, Raina S, Moon C, Guggino WB, Nielsen S (1 October 1993). 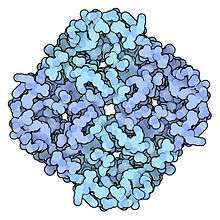 "Aquaporin CHIP: the archetypal molecular water channel". Am. J. Physiol. 265 (4 Pt 2): F463–76. PMID 7694481. ↑ Mitsuoka K, Murata K, Walz T, Hirai T, Agre P, Heymann JB, Engel A, Fujiyoshi Y (1999). "The structure of aquaporin-1 at 4.5-A resolution reveals short alpha-helices in the center of the monomer". J. Struct. Biol. 128 (1): 34–43. doi:10.1006/jsbi.1999.4177. PMID 10600556. ↑ de Groot BL, Grubmüller H (2005). "The dynamics and energetics of water permeation and proton exclusion in aquaporins". Curr. Opin. Struct. Biol. 15 (2): 176–83. doi:10.1016/j.sbi.2005.02.003. PMID 15837176. ↑ Benga G, Popescu O, Pop VI, Holmes RP (1986). "p-(Chloromercuri)benzenesulfonate binding by membrane proteins and the inhibition of water transport in human erythrocytes". Biochemistry. 25 (7): 1535–8. doi:10.1021/bi00355a011. PMID 3011064. ↑ Kuchel PW (2006). "The story of the discovery of aquaporins: convergent evolution of ideas--but who got there first?". Cell. Mol. Biol. (Noisy-le-grand). 52 (7): 2–5. PMID 17543213. ↑ G Benga. "Gheorghe Benga". Ad Astra - Online project for the Romanian Scientific Community. Archived from the original on December 25, 2007. Retrieved 2008-04-05. ↑ Paganelli CV, Solomon AK (November 1957). "The rate of exchange of tritiated water across the human red cell membrane". J. Gen. Physiol. 41 (2): 259–77. doi:10.1085/jgp.41.2.259. PMC 2194835 . PMID 13475690. ↑ Parisi M, Dorr RA, Ozu M, Toriano R (December 2007). "From membrane pores to aquaporins: 50 years measuring water fluxes". J Biol Phys. 33 (5–6): 331–43. doi:10.1007/s10867-008-9064-5. PMC 2565768 . PMID 19669522. ↑ Fu D, Lu M (2007). "The structural basis of water permeation and proton exclusion in aquaporins". Mol. Membr. Biol. 24 (5–6): 366–74. doi:10.1080/09687680701446965. PMID 17710641. ↑ Gravelle S, Joly L, Detcheverry F, Ybert C, Cottin-Bizonne C, Bocquet L (2013). "Optimizing water permeability through the hourglass shape of aquaporins". PNAS. 110 (41): 16367–16372. arXiv:1310.4309 . Bibcode:2013PNAS..11016367G. doi:10.1073/pnas.1306447110. PMC 3799357 . PMID 24067650. ↑ de Groot BL, Grubmüller H (2001). "Water permeation across biological membranes: mechanism and dynamics of aquaporin-1 and GlpF". Science. 294 (5550): 2353–2357. Bibcode:2001Sci...294.2353D. doi:10.1126/science.1062459. PMID 11743202. ↑ Tajkhorshid E, Nollert P, Jensen M, Miercke LJ, O'Connell J, Stroud RM, Schulten K (2002). "Control of the selectivity of the aquaporin water channel family by global orientational tuning". Science. 296 (5567): 525–30. Bibcode:2002Sci...296..525T. doi:10.1126/science.1067778. PMID 11964478. ↑ Nielsen S, Frøkiaer J, Marples D, Kwon TH, Agre P, Knepper MA (2002). "Aquaporins in the kidney: from molecules to medicine". Physiol. Rev. 82 (1): 205–44. doi:10.1152/physrev.00024.2001 (inactive 2015-01-09). PMID 11773613. ↑ Sands JM. 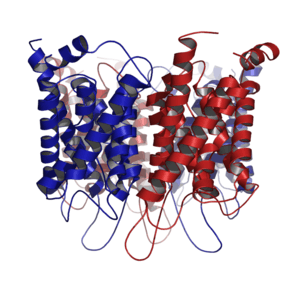 Aquaporin 2: Not Just for Moving Water. Journal of the American Society of Nephrology : JASN. 2012;23(9):1443-1444. doi:10.1681/ASN.2012060613. ↑ Chaumont, François; Tyerman, Stephen D. (2014-04-01). "Aquaporins: Highly Regulated Channels Controlling Plant Water Relations1". Plant Physiology. 164 (4): 1600–1618. doi:10.1104/pp.113.233791. ISSN 0032-0889. PMC 3982727 . PMID 24449709. 1 2 3 Johansson, Ingela; Karlsson, Maria; Johanson, Urban; Larsson, Christer; Kjellbom, Per (2000-05-01). "The role of aquaporins in cellular and whole plant water balance". Biochimica et Biophysica Acta (BBA) - Biomembranes. 1465 (1–2): 324–342. doi:10.1016/S0005-2736(00)00147-4. ↑ Kaldenhoff R, Bertl A, Otto B, Moshelion M, Uehlein N (2007). "Characterization of plant aquaporins". Meth. Enzymol. Methods in Enzymology. 428: 505–31. doi:10.1016/S0076-6879(07)28028-0. ISBN 9780123739216. PMID 17875436. ↑ Kammerloher W, Fischer U, Piechottka GP, Schäffner AR (1994). "Water channels in the plant plasma membrane cloned by immunoselection from a mammalian expression system". Plant J. 6 (2): 187–99. doi:10.1046/j.1365-313X.1994.6020187.x. PMID 7920711. ↑ Maeshima M (2001). "TONOPLAST TRANSPORTERS: Organization and Function". Annu Rev Plant Physiol Plant Mol Biol. 52 (1): 469–497. doi:10.1146/annurev.arplant.52.1.469. PMID 11337406. ↑ Wallace IS, Choi WG, Roberts DM (2006). 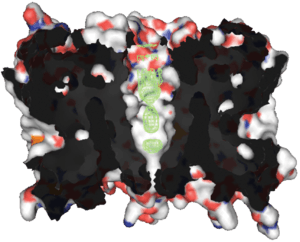 "The structure, function and regulation of the nodulin 26-like intrinsic protein family of plant aquaglyceroporins". Biochim. Biophys. Acta. 1758 (8): 1165–75. doi:10.1016/j.bbamem.2006.03.024. PMID 16716251. ↑ Johanson U, Gustavsson S (2002). "A new subfamily of major intrinsic proteins in plants". Mol. Biol. Evol. 19 (4): 456–61. doi:10.1093/oxfordjournals.molbev.a004101. PMID 11919287. ↑ Kaldenhoff R, Fischer M (2006). "Aquaporins in plants". Acta Physiol (Oxf). 187 (1–2): 169–76. doi:10.1111/j.1748-1716.2006.01563.x. PMID 16734753. ↑ Azad AK, Sawa Y, Ishikawa T, Shibata H (2004). "Phosphorylation of plasma membrane aquaporin regulates temperature-dependent opening of tulip petals". Plant Cell Physio. 45(5) (5): 608–17. doi:10.1093/pcp/pch069. PMID 15169943. ↑ Azad AK, Katsuhara M, Sawa Y, Ishikawa T, Shibata H (2008). "Characterization of four plasma membrane aquaporins in tulip petals: a putative homolog is regulated by phosphorylation". Plant Cell Physiol. 49(8) (8): 1196–208. doi:10.1093/pcp/pcn095. PMID 18567892. ↑ Bichet DG (2006). "Nephrogenic diabetes insipidus". Adv Chronic Kidney Dis. 13 (2): 96–104. doi:10.1053/j.ackd.2006.01.006. PMID 16580609. ↑ Okamura T, Miyoshi I, Takahashi K, Mototani Y, Ishigaki S, Kon Y, Kasai N (2003). "Bilateral congenital cataracts result from a gain-of-function mutation in the gene for aquaporin-0 in mice". Genomics. 81 (4): 361–8. doi:10.1016/S0888-7543(03)00029-6. PMID 12676560. ↑ Khanna A (2006). "Acquired nephrogenic diabetes insipidus". Semin. Nephrol. 26 (3): 244–8. doi:10.1016/j.semnephrol.2006.03.004. PMID 16713497. ↑ Lennon VA, Kryzer TJ, Pittock SJ, Verkman AS, Hinson SR (2005). "IgG marker of optic-spinal multiple sclerosis binds to the aquaporin-4 water channel". J. Exp. Med. 202 (4): 473–7. doi:10.1084/jem.20050304. PMC 2212860 . PMID 16087714. Computational Biomolecular Dynamics Group. "Aquaporin movies and pictures". Max Planck Institute. Archived from the original on April 25, 2006. Retrieved 2008-01-23. Artem B. Mamonov; Rob D. Coalson; Mark L. Zeidel; John C. Mathai. "Water and Deuterium Oxide Permeability through Aquaporin 1: MD Predictions and Experimental Verification". Journal of General Physiology. Retrieved 2014-09-19.